Do I Have to Worry About Rodents in My Car? And what you can do to deal with this problem. A rodent problem is one of the most frustrating problems that a property owner may encounter. Rodents, such as mice or rats, are dirty, carry diseases, and can destroy wiring and upholstery. Most of us only worry about rodent infestations with regard to our houses, however rodents also infest cars and can cause terrible damage. Small rodents can fit into the tiniest openings and wreak havoc. Mice are notorious for crawling into vents, dying, and filling the vehicle with a horrible stench. 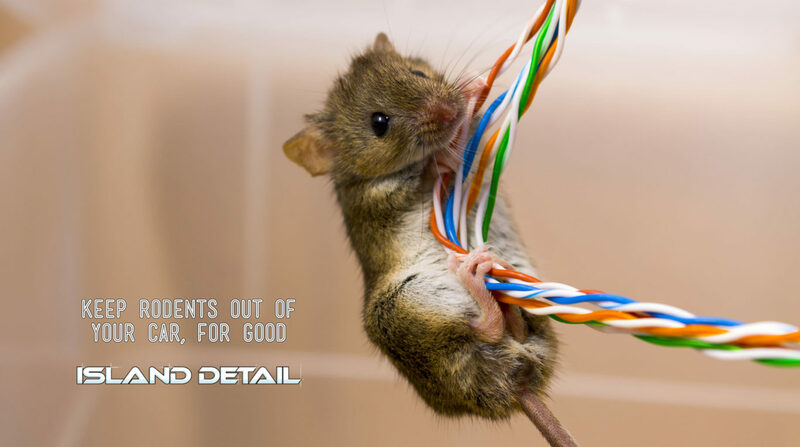 Mice also nibble on important components of your car, such as wires, tubes, and circuitry. If nothing is done to prevent or deal with a mice infestation, your vehicle’s performance may suffer. This article discusses how to prevent rodents from getting into your engine, air filter, vents, and passenger space, as well as how to deal with a rodent that’s found its way in. Mice are burrowing animals, which means they are experts at fitting themselves through tiny openings. Although locking your car helps to prevent human-sized intruders, it does little against mice. Generally, small rodents crawl up under the engine and then make their way further inside. The most common points of entry are vents, holes around cables, pedal shafts, steering columns… and open windows. What Time of Year Are Mice Most Active? Many small rodents, such as mice, do not hibernate, which means they are scurrying around during all months of the year. However, the cold of winter compels these animals to seek warm shelter – thinking along these lines, it starts to make sense why a mouse might perceive your recently-turned-off vehicle to be an attractive place to hide. Mice are also nocturnal, meaning they are most likely to enter your vehicle when you aren’t there to catch them. When reaching for a pair of sunglasses or a map in your glove compartment, the last thing you want to see or touch is a live or dead mouse. Here is some advice to help you avoid this situation. Keep your car clean. Garbage, even non-food related items like paper or tissues, attract mice and rats because they can use the material to create nests. Keep your car dry. Like all living things, rodents require water to live and are attracted to moist areas. Take measures to rid your car of condensation, and it will become a less-attractive prospect for mice. Clear foliage from around your vehicle. In the autumn, mice make burrows in piles of fallen leaves. If foliage surrounds your car, the little critters have an easier time making their way into your vehicle. Make sure all doors and windows are completely shut. This one is pretty obvious; an open window, door, or sunroof is an invitation for a rodent seeking shelter. Use a repellent. There are many products on the market, and even some DIY options, that use scent to repel mice and other small rodents. If you park your car in an area that is particularly susceptible to a mouse infestation, consider investing in some form of odour repellent. What Happens Once They Are Inside? Despite all these measures, there is no guaranteed way to prevent a persistent rodent from entering your vehicle. When all the preventative measures fail, there are traps that are specifically designed for automotive use. Prevention is definitely the best policy, but if they enter, you need to remove them just like you would in your home, and then do a complete detail of the inside of your vehicle to remove all of the harmful bacteria left behind by their fur and droppings. We specialize in inch-by-inch deep cleans, so please give us a shout if you have had a rodent invasion in your car, truck, or SUV.